Our Rectangle name badge silver is the most popular name badge range to match your branding needs. The new Lens cover is a clear plastic cover that clips onto the name badge. It is made of high-strength polycarbonate to protect your badge. This complimentary fitting covers many different purposes. You can attach to your clothing with the standard safety pin fitting or the strong alligator grip. 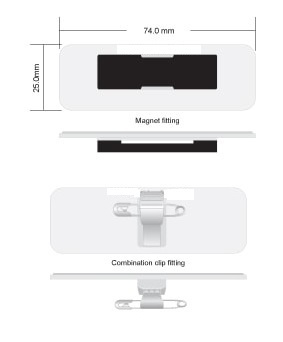 The Magnetic Fitting is the right choice if you need that strength and longevity to secure your name badge. A professional fitting used in many service industries. Copyright © 2018 Name Badges India.